Castle Comfort Stairlifts offers top brand stairlifts, keen prices and fast installs for all those seeking stairlifts in Birmingham. And all work comes with our no-quibble guarantees and famous customer service satisfaction. Give us a call today on 0121 371 0123. Choosing a stairlift in Birmingham has for some time been a little easier. 'Brummies' can even take the short hop up the M6 to a stairlifts showhouse to try one! But if not, Castle Comfort Stairlifts who have been arranging installations of their straight and curved stair lifts in what is regarded as the UK's 'Second City' for over a decade, have opened their Birmingham office. Following the interest in other 'UK City Stairlift blogs' we'll bring you here a Birmingham version - with some fascinating, and at times, amusing facts about this interesting place. 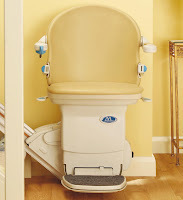 First - if your priority is to get a price and further information click on a Chair Lift . Now, and we promise you'll find, upon that click, just what you want... then, book mark this page to get back to as soon as you have chance - for some interesting things about your city - BIRMINGHAM. And congratulations Birmingham City, today (27th Feb 2011) you wrote history for all, as beating Arsenal in the Carling Cup Final has delighted everyone! All football fans from Stoke on Trent, home of stairlifts specialists Castle Comfort - know how you feel - as their team Stoke City FC) also beat Arsenal by the same score. It's Birmingham's second trophy - they won the 'league cup' a few years before - though followers in those days are perhaps a touch older - and who knows may need a stairlift! It's Stoke City's tjurn at Wembley now - first with Bolton Wanderers in the FA Cup semi final - then back a few weeks later to thrash the pants of one of the Manchester giants! Come on Birmingham soccer fans, give us a shout - you must be on the side of your allies from Stoke on Trent! Birmingham population statistication freaks, have a look here. - This will delight you - or totally bore you to desperation. What language is spoke in Birmingham? English of course.. well try Brummagem, which is a word deriving from 'Bromwicham' an earlier name for the city. Brummagen is the correct word for the distinct dialect of the 'Brummies' - (that is the name of the natives there) and it's a totally different dialect from that spoken by those from the adjacent Black Country. The young lady filmed here - is not speaking Welsh, Russian or Icelandic, she is in fact supposedly a junior Brummie - and if anyone can work out what's being said, or even confirm the lingo, please email us at castlecomfortcentre.com and we'll put in a tenner into this good cause. Birmingham is famous for more than its unique dialect. The city has some notable football clubs, Birmingham City, Aston Villa and West Bromwich Albion. Birds Custard comes from here and only a few hundred yards from the renowned Bull Ring Shopping Centre is 'The Custard Factory' - the area's revolutionary new arts and media quarter. It was first built a century ago and now homes Birmingham's finest restaurants, shops, nightclubs and live music.Birmingham is known as the City of the Thousand Trades. Can you name some of them? Have a look at this quiz. Arthur Conan Doyle is amongst a host of famous names originating from the UK's second largest city as well as Nigel Mansell, William Murdoch, and chocolate extraordinaire George Cadbury. The amount of fame in the music world here is huge - with Black Sabbath, Duran Duran, ELO, Traffic and UB40 all of Brummie origins and beginnings. For a galaxy of other famous names belonging to Birmingham go to the stage now. Sadly in Birmingham one one the worsts terrorist atrocities was carried out by the IRA in 1974- the Birmingham Pub Bombings. See the Wikipedia account. All of us in the stairlift industry hope that the terrible history book written as a result of the troubles in Belfast and the rest of Northern Ireland is now closed. Castle Stairlifts have put their vote of confidence in to the Northern Ireland's economy by opening its BELFAST registered office. Back to Stairlifts, and Castle Comfort continue their nationwide expansion with the opening of their Birmingham administration office which will, serve well communications-wise, the whole of the city and surrounding areas and places including - West Bromwich, Sutton Coldfield, Solihull, Walsall, Kenilworth, Dudley, Halesowen, Sutton Coldfield, Tamworth, Stourbridge, Kidderminster, Stourbridge and Redditch. In fact with an excellent road system in the Birmingham area installations, visits to quote throughout Warwickshire and the West Midlands can be made at very short notice. 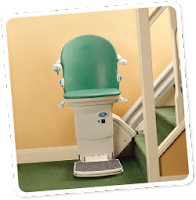 Castle Comfort have installed many curved and straight Stairlifts in Warwick, Leamington Spa, Nuneaton, Hinckley, Rugby and Coventry. None of these places are more than an hour away from the new Birmingham base. Solihull, Redditch, Bromsgrove, Worcester, Droitwich, Meiden and Balsall Common are placs where scores of happy Castle Comfort clients live. And to change the subject somewhat - here is a telephone number we all know but sometimes don't use it when we should - - 999 - NEVER BE AFRAID TO DIAL IT. Providing stairlifts to stroke victims and learning how cases were dealt with has reinforced time and time again to Castle Comfort staff that attention within minutes of a STROKE is vital for a good chance of a complete recovery. How can we recognize a stroke? BY THE FAST TEST - The Face-Arm-Speech-Time (FAST) test lists the main symptoms to look out for: •Face: Has the person's face fallen on one side? Can the person smile? Has their mouth or eye drooped? •Arms: Can the person raise both arms and keep them there? •Speech: Is their speech slurred? •Time: Time to call 999 if you see or even suspect one or more of these signs. Announce 'STROKE' and briefly explain what you have seen and give clear concise details of where you are. Links Stroke - even if think you know the signs of one, just check Glanmore for your special needs mobility products, excluding Stairlifts! Hotfrog .... to us - to find what you want and where you want it Manchester do you have relatives here? See their blog. A Riser Recliner Chair? see this very comfortable display. Grants - never easy as you can read here - but Castle Comfort can often advise and help. Assistance is sometime available from unexpected sources. And last but not least - to get your Stairlift quote, go ... here. ............................................................. Birmingham From Wikipedia, the free encyclopedia Jump to 'navigation' and search it. This article is about the city in England. For the U.S. city named after it, see Birmingham (USA) Some of the nicknames the city has acquired over the years are "Brum", "Brummagem", "Second City", "City of a thousand trades", and "Workshop of the World" Motto: Forward . Can anyone explain why this is? We don't know. Birmingham's technical location is 'within England and the in West Midlands' and coordinates: 52°28′59″N 1°53′37″W﻿ / ﻿52.48306°N 1.89361°W﻿ / 52.48306; -1.89361. So if you are from Brum and someone boring on an aeroplane talks to you you can answer them with that and they will then probably go to sleep. If the don't straight away - say Birmingham is- 'a sovereign state of the United Kingdom. Constituent country England,Region West Midlands, and is a Ceremonial county West Midlands and its Administrative HQ is The Council House.' . The city was founded 7Th century and its Municipal borough 1838 City 1889 It's authority definition - Metropolitan borough and its an official political name - Birmingham City Council The Lord Mayor is Michael Wilkes The Deputy Lord Mayor is Chauhdry Abdul Rashid The council leader is Mike Whitby (Conservative) therefore the Council is a Controlled Conservative / Liberal Democrat Progressive Partnership Area - Total 267.77 km2 (103.4 sq mi) Elevation 140 m (459 ft) Population (2008 est.) - Total 1,016,800 (Ranked 1st) - Density 3,739/km2 (9,684/sq mi) - Conurbation 2,284,093 - Ethnicity (2007 estimates) 66.7% White (62.1% White British) 21.0% South Asian 6.7% Black 3.2% Mixed Race 1.2% Chinese 1.2% Other Time zone Greenwich Mean Time (UTC+0) - Summer (DST) British Summer Time (UTC+1) Postcode B Area code(s) 0121 ISO 3166 code GB-BIR ONS code 00CN OS grid reference SP066868 ............................................................................ The official Birmingham website is - http://www.birmingham.gov.uk/ Birmingham is a city and metropolitan borough in the West Midlands county of England. It is the most populous British city outside London with a population of 1,016,800 (2008 estimate), and is situated at the heart of the West Midlands conurbation, the UK's 2nd most populous Urban Area with a population of 2,284,093 according to the 2001census. Birmingham's metropolitan area, which includes surrounding towns to which it is closely tied through commuting, is the United Kingdom's second most populous with a population of 3,683,000. Birmingham was the powerhouse of the Industrial Revolution in England, a fact which led to it being known as "the workshop of the world" or the "city of a thousand trades". Although Birmingham's industrial importance has declined, it has developed into a national commercial centre, being named as the second-best place in the United Kingdom to locate a business. Birmingham is a national hub for conferences, retail and events along with an established high tech, research and development sector, supported by its three Universities. It is also the fourth-most visited city by foreign visitors in the UK, has the second-largest city economy in the UK and is often referred to as the Second City. In 2010, Birmingham was ranked as the 55th-most livable city in the world, according to the Mercer Index of worldwide standards of living. The Big City Plan is a large redevelopment plan currently underway in the city centre with the aim of making Birmingham one of the top 20 most livable cities in the world within 20 years.People from Birmingham are known as 'Brummies', a term derived from the city's nickname of 'Brum'. This may originate from the city's dialect name, Brummagem,which may in turn have been derived from one of the city's earlier names, 'Bromwicham'. There is a distinctive Brummie dialect and accent, both of which differ from the adjacent Black Country. History Main articles: History of Birmingham, Economic history of Birmingham, and Timeline of Birmingham history William Westley's 1731 map of Birmingham. The top of the map is oriented westwards.Some of the earliest evidence of settlement in Birmingham are artifacts dating back 10,400 years discovered near Curzon Street in the city centre. In the early 7th century , Birmingham was an Anglo-Saxon farming hamlet on the banks of the River Rea. It is commonly believed that the name 'Birmingham' comes from "Beorma inga ham", meaning farmstead of the sons (or descendants) of Beorma.Birmingham was first recorded in written documents by the Domesday Book of 1086 as a small village, worth only 20 shillings. There were many variations on this name. Bermingeham is another version. In 1166 the holder of the manor of Birmingham, Peter de Birmingham, was granted a royal charter to hold a market in his castle, which in time became known as the Bull Ring, transforming Birmingham from a village to a market town. The de Birmingham family continued to be Lords of Birmingham until the 1530s when Edward de Birmingham was cheated out of its lordship by the traitor John Dudley. As early as the sixteenth century, Birmingham's access to supplies of iron ore and coal meant that metal working industries became established. By the time of the English Civil War in the 17th century, Birmingham had become an important manufacturing town with a reputation for producing small arms. Arms manufacture in Birmingham became a staple trade and was concentrated in the area known as the Gun Quarter. During the Industrial Revolution (from the mid-18th century onwards), Birmingham grew rapidly into a major industrial centre and the town prospered. Birmingham’s population grew from 15,000 in the late 17th century to 70,000 a century later During the 18th century, Birmingham was home to the Lunar Society, an important gathering of local thinkers and industrialists. Thomas Attwood addressing the Birmingham Political Union during the Days of May, 1832Birmingham rose to national political prominence in the campaign for political reform in the early nineteenth century, with Thomas Attwood's Birmingham Political Union bringing the country to the brink of civil war and back during the Days of May that preceded the passing of the Great Reform Act in 1832. The Union's meetings on Newhall Hill in 1831 and 1832 were the largest political assemblies Britain had ever seen. Lord Durham, who drafted the act, wrote that "the country owed Reform to Birmingham, and its salvation from revolution". By the 1820s, an extensive canal system had been constructed, giving greater access to natural resources to fuel to industries. Railways arrived in Birmingham in 1837 with the arrival of the Grand Junction Railway, and a year later, the London and Birmingham Railway. During the Victorian era, the population of Birmingham grew rapidly to well over half a million and Birmingham became the second largest population centre in England. Birmingham was granted city status in 1889 by Queen Victoria. The city established its own university in 1900. Birmingham in 1886Birmingham suffered heavy bomb damage during World War II's "Birmingham Blitz", and the city was extensively redeveloped during the 1950s and 1960s. This included the construction of large tower block estates, such as Castle Vale. The Bull Ring reconstructed and New Street station was redeveloped. In recent years, Birmingham has been transformed, with the construction of new squares like Centenary Square and Millennium Place. Old streets, buildings and canals have been restored, the pedestrian subways have been removed, and the Bull Ring shopping centre has been completely redeveloped. These were the first steps in the ambitious plans of Birmingham City Council for the redevelopment of Birmingham, which has become known as the Big City Plan. In the decades following the Second World War, the ethnic makeup of Birmingham changed significantly, as it received waves of immigration from the Commonwealth of Nations and beyond. The city's population peaked in 1951 at 1,113,000 residents. Some pretty famous people originate from 'Brum' Come back here to see a few examples. THAT'S IT FOLKS! Info - thanks to Wikipedia. BUT FINALLY THE DAILY MAIL IS CURRENTLY REPORTING ON A INQUEST/HEARING INTO SOMETHING OF A STAIRLIFT DISASTER - SEE HERE HOW NOT TO MARKET YOUR STAIRLIFTS ! LINKS See here a fascinating blog on new home development in Birmingham. And go here to shop in Birmingham. Here below, as with all our regional stairlift blogs, we have some of the notable residents (past and present) from the area. It’s always remarkable, how many people do not know just who comes from where they live. Sir Michael Balcon, film director. Alfred Bird, inventor of custard powder. Geezer Butler, bassist of Black Sabbath. Bill Ward, drummer of Black Sabbath. Jasper Carrott, comedian Neville Chamberlain, former prime-minister. Richard Hammond, TV presenter, Mr Hudson, singer. Washington Irving, author. Cat Deeley TV presenter, Trevor Eve, Actor. Bill Oddie, comedian and ornithologist, Ozzy Osbourne, singer of Black Sabbath. Jamelia, singer. Victoria Wood, actress. Our health-conscious Birmingham followers showed an interesting reaction to the article above on STROKES - so without wishing to sound morbid - we bring you here another section in relation to HEART ATTACKS. Heartburn or heart attack? How to tell the difference - More than 225,000 people suffer from heart attacks in the UK each year, and sadly, about one in three die before even reaching the hospital. That means on average, just in the city of Birmingham alone, over 4,000 annually are victims – and of those, statistically, some 1360 don’t survive long enough to even get close to needing a stairlift. Heart attacks need to be dealt with immediately. The odds of surviving a heart attack are significantly improved if you are treated within 90 minutes of experiencing the first symptoms. It is odd how we can ignore certain medical conditions. Despite being a medical emergency, too many people delay calling for an ambulance when symptoms start. Research from the US has found that men waited an average of two and a half hours before contacting the emergency services, and women took even longer. A likely explanation for this is that people know only one of the main symptoms of heart a heart attack - chest pain - but don't know the others. Even then, if the chest pain is mild, heart attack victims often put it down to a bad case of heartburn or indigestion. So how can you tell the difference? Heart Attack Warning Signs The common or 'classic' symptoms of a heart attack include: · Pain in the centre of the chest · Chest pain which spreads to the arms, neck or jaw · Chest pain and feeling sick or sweaty · Chest pain and shortness of breath. The less commons symptoms of a heart attack include: · A dull pain, ache, or ‘heavy’ feeling in the chest · A mild discomfort in the chest that makes you feel generally unwell · A pain in your chest that can spread to the back or stomach · A chest pain that feels like a bad episode of indigestion · Feeling light-headed or dizzy as well as having chest pain . Heart attack symptoms differ from person to person. Chest pain can vary from mild discomfort in the centre of the chest to severe pain, which is often described as a heavy pressure, crushing or tightness. But, for others, the chest pain may be relatively mild, but accompanied by some of the other symptoms, so recognising a pattern of symptoms is key - 'heartburn' with breathlessness and sweating needs to be checked out. Both men and women can experience common or uncommon symptoms of a heart attack, or even a combination of both. Either way, they need to be dealt with immediately. Look after yourself and also be on the cautious side. Many folk invest in stairlifts because they are being careful and protecting themselves against not certain (but possible) disasters – like slipping or falling on the stairs. Treat a pain with the same caution and dial 999. It's what you pay your taxes for. A paramedic and doctor would be delighted to find out you only have heart burn! Why not take the 'Healthy Heart Quiz' - here. Nice to see Stairlifts in Birmingham rather than having to rely on faceless national companies and their salesmen calling every day after making a general enquiry. I will pop along and talk with you later. I have booked marked your website and will call first to make an appointment for a curved stairlift quoation. I agree with the 1st post, it is about time that keeping it local returned to the market place. Customers are fed up with dealing with Hard nosed "surveyors" (salesmen)from huge companies who want nothing more than to get a huge commission on selling a curved stairlift. You cant beat a personal service, especialy with mobility products, and even more so with Stairlifts. Lets Keep it local, and get the best possible service from people who care. I spend 30 years learning English, now I have to start with Brummie? Well, in Spain we´ll stick to talking about stairlifts in inglés and español!! It took one word from our former family GP Dr Stirling that we should use Castle Comfort - (his base company in my home town of Stoke) for my aunt's stairlift. We rang the Birmingham office and the job was sorted in no time. Good stuff! 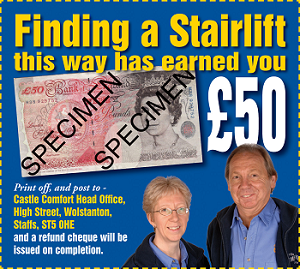 Where to shop for a Stairlift in the Midlands - that is the question? whether it is nobler to buy a Stairlift at Castle Comfort Stairlifts or to suffer the slings and arrows of outrageous fortune at a large conglomerate ? The advice regarding early response to those showing symptoms of a stroke is excellent. Every second counts. Most emergency services will respond immediateley with an authorative declaration such as 'people assisting the person believe they have diagnosed a stroke' Do not spend time describing the tell-tale signs. Working in the NHS we are not supposed to recommend particular stairlift firms. However after giving a choice of three different ones to patients in several instances, I discovered that on each occasion - they picked the same one - Castle Comfort Stairlifts. They made their decision for different reasons and I belive it was a mixture of price, attitude and service. I think I can safely recommend Castle Stairlifts straight off in the future. Since 'occtherapy1979's comment appeared her here in April we have had an increased flow of enquiries (more than normal) from the Birmingham area for stairlifts. Many of these Midlands-based people mentioned that they had been told to call us by their occupational therapist. Irrespective of whether the ethics allow a health professional to recommend a company - we'd just like to say to 'occtherapy1979' - whoever and whereevr exactly you are - thank you. There's certainly a lot of interesting facts about Birmingham here. Maybe with such a big engineering heritage one of the stairlift firms can make use of the local skills making vehicles and set up a factory making stairlifts which is transport of a different kind. engineering skills are everywhere there. के रूप में बर्मिंघम के एक बड़े पंजाबी बोल poulation है हम बाहर बात करना चाहते हैं कि कैसल सुविधा Stairlifts (स्टोक में हमारे सिर कार्यालय और Digbeth में एक स्थानीय क्षेत्रीय कार्यालय में, बर्मिंघम हम विभिन्न संस्कृतियों के बावजूद शहर में हर किसी की सेवा के लिए तैयार हैं. एकहमारे stairlift इंजीनियरों की Banngladeshi मूल की वास्तव में अनुवाद के साथ मदद कर सकते हैं अगर वहाँ संचार के साथ कोई समस्या है. ਦੇ ਰੂਪ ਵਿੱਚ ਬਰਮਿੰਘਮ ਦੇ ਇੱਕ ਵੱਡੇ ਪੰਜਾਬੀ ਬੋਲ poulation ਹੈ ਅਸੀ ਬਾਹਰ ਗੱਲ ਕਰਣਾ ਚਾਹੁੰਦੇ ਹਾਂ ਕਿ ਕੈਸਲ ਸਹੂਲਤ Stairlifts ( ਸਟੋਕ ਵਿੱਚ ਸਾਡੇ ਸਿਰ ਦਫ਼ਤਰ ਅਤੇ Digbeth ਵਿੱਚ ਇੱਕ ਮਕਾਮੀ ਖੇਤਰੀ ਦਫ਼ਤਰ ਵਿੱਚ , ਬਰਮਿੰਘਮ ਅਸੀ ਵੱਖਰਾ ਸੰਸਕ੍ਰਿਤੀਆਂ ਦੇ ਬਾਵਜੂਦ ਸ਼ਹਿਰ ਵਿੱਚ ਹਰ ਕਿਸੇ ਦੀ ਸੇਵਾ ਲਈ ਤਿਆਰ ਹਨ . ਏਕਹਮਾਰੇ stairlift ਇੰਜੀਨੀਅਰਾਂ ਦੀ Banngladeshi ਮੂਲ ਦੀ ਵਾਸਤਵ ਵਿੱਚ ਅਨੁਵਾਦ ਦੇ ਨਾਲ ਮਦਦ ਕਰ ਸੱਕਦੇ ਹਾਂ ਜੇਕਰ ਉੱਥੇ ਸੰਚਾਰ ਦੇ ਨਾਲ ਕੋਈ ਸਮੱਸਿਆ ਹੈ . We are pleased to be able to comment in Indi text and Punjabi that people of Birminham of all cultures and origins are welcome to contact us if there is a need in the family for a stairlift. One of our stairlifts engineers is in fact of Bangladeshi origin and has offered to assist at any time with translations if necessary. Keith Simpson, Castle Comfort Stairlifts, Birmingham. How many stairlifts have you now installed in the Birmingham area? I don't have the exact figures to hand but I do know a lot of our customers who travel to our stairlift showroom in the North West Midlands actually come from around Birmingham, and being Englands second city population wise it is probably the second biggest base of customers we have for stairlifts after London. Please send quote for stairs lift for our mosque main staircase. I spoke to you earlier but have lost the details. You can email me at the address i gave you. Thanks to this blog i recalled at great football match that i had the pleasure of seeing when the Birmingham won at Arsenal FC. That was good, but the other important things coming from Birmingham than sporting successes, are the stairlifts that Castle Comfort provide to all citizens... even Arsenal fans! I am grateful to this blog for the info. I live in Birmingham and I'm interested in a stair lift for my husband because it could improve accessibility problems in our home. My husband has arthritis and I think it would improve our quality of life. I wonder if Castle Comfort offers a personalized service and how long it would take for the installation of a stairlift? How much do stairlifts cost in Birmingham ... more or less? We have a cousin there and she is thinking of moving because they cannot climb stairs. Cheaper to buy a stairlift than move perhaps. Hi Keovff, sorry for the delayed response. How much do stairlifts cost? Straight reconditioned ones can be less that a thousanad pounds.Go much less and you may get an old one with a short guarantee. Some fiorms advetise price these days from even £400 - but that is either a 'porky' or they are not providing anything worthwhile for that. Be careful. New ones can be between £1100 and £3,000 - that's a big gap I know, but it depends on what make and how hard you negotiate. Plus of cours the length of guarantee which can be up to five years. Curved stairlifts prices have come down a lot - they can be from £2,500 upwards again depending on the same facts. When your relative is ready let us know and we'll will arrange a quote (or several from different makers) and guide them through the process before they make a decision. But it makes more sense than moving house. Can you tell me how safe are the stairlifts please? My mother is very old and not very strong. Is it ok for her? In Stoke-on-Trent, a stairlift owner tragically died in an avoidable accident on the stairs. The lady, who was only fifty-five, was found dead by her daughter, an appalling experience for anyone and she has my sympathy. It seems that her mother had fallen, resulting in her head becoming trapped between the wall and the stirlift rail. The headline could have implied that somehow the stairlift was a factor in the accident, but this was not the case. An inquest was told that In spite of her severe physical problems, the lady never used the stairlift and walked on the stairs, having expressed the fear that she would lose the use of her legs. Clearly, her stairlift was not to blame. Had she used the lift, the accident may not have happened. With the greatest of respect, it has to be noted that she had been in the habit of the regular excessive consumption of alcohol. The coroner ruled that to be a factor in the accident, not the stairlift. To end on a lighter note. A very little guy, wearing a very little green suit and a very little green hat was seen going up and down on a stairlift in a Birmingham stairlift showroom. When asked what he was doing he explained that he was carrying out an elf and safety inspection!